On Sunday from 1 to 5 p.m., more than 150 people from multi-racial groups will participate in small group conversations on racism and intolerance. The event is free to attend. 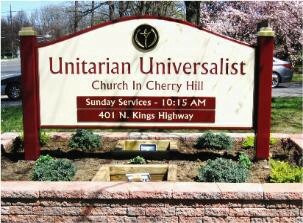 A partnership of local faith communities and civic associations will host “Racism and Intolerance Conversations” at Unitarian Universalist Church in Cherry Hill this weekend. On Sunday from 1 to 5 p.m., more than 150 participants from multi-racial groups will engage in small group conversations in which individuals will exchange personal experiences related to racism and intolerance. The purpose of this event it to create bonds among a diverse group of people through the sharing of stories of racism and intolerance to forge a common effort to address these complicated and deep-seated issues. Unitarian Universalist Church in Cherry Hill, Christ our Light Catholic Church, the Cherry Hill African American Civic Association and Congregation M’kor Shalom are also sponsors of Sunday’s event. Representatives from several local organizations will be in attendance. Support and training for the event has been provided by Beyond Diversity Resource Center in Mt. Laurel. Admission to the event is free. Pre-registration is required. To register, visit https://www.eventbrite.com/myevent/31414064312/reports/sales-by-ticket-type/?s=1&tickets=60884636.